We know what you’re thinking right now, parents. “Yeah, right. 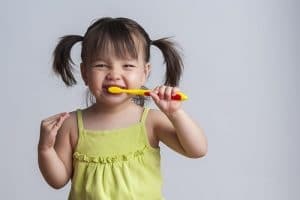 My kid will never be excited about brushing.” The trick is combining fun and productivity and letting your child be involved in their oral healthcare. The 5 tips below will not only increase your child’s level of fun, but also enhance their self-worth and social skills. Let your child pick out and buy their own toothbrush and toothpaste. Making your child a part of the buying process will help them to be proud of their new purchase and make brushing more enjoyable. This is also a great lesson on responsibility! Being responsible means spending your hard-earned money on things we need, before buying things we want. Teach your little one how to brush. Break the process into small steps that the child can understand and practice. Another way is to place a hand over the child’s hand to guide the toothbrush as the child brushes. Your dentist at Dental365 is a great resource for help in this area. Keeping the child engaged in brushing. Use a timer, song, or counting as a game to encourage brushing for a full 2 minutes. Let your child help schedule their dental appointments. To help get your child excited for their upcoming cleaning and exam let them take part in dialing the phone number and asking to schedule an appointment or typing the appointment request if scheduling online. The friendly staff at Dental365 will be happy to speak with and encourage your child in their endeavors. Incorporate “Brush, Book, Bed!” into your nighttime routine. Brush, Book, Bed, a program of the American Academy of Pediatrics (AAP), has a simple and clear message for parents. Each night, you help your children to brush their teeth, then read a favorite book, then go to bed at a regular time each night. Having a predictable nighttime routine will help them develop good habits for life. Additionally, routines may ease the stress that some families experience at bedtime.